Home on shore leave during WWII. First, about me: I am a Vet and third generation Navy man. My great Grandfather, Thomas John Aldridge served in the Merchant Marines for many years. (For those who don't know, merchant ships were more likely to come under enemy fire than Navy fighting-ships.) 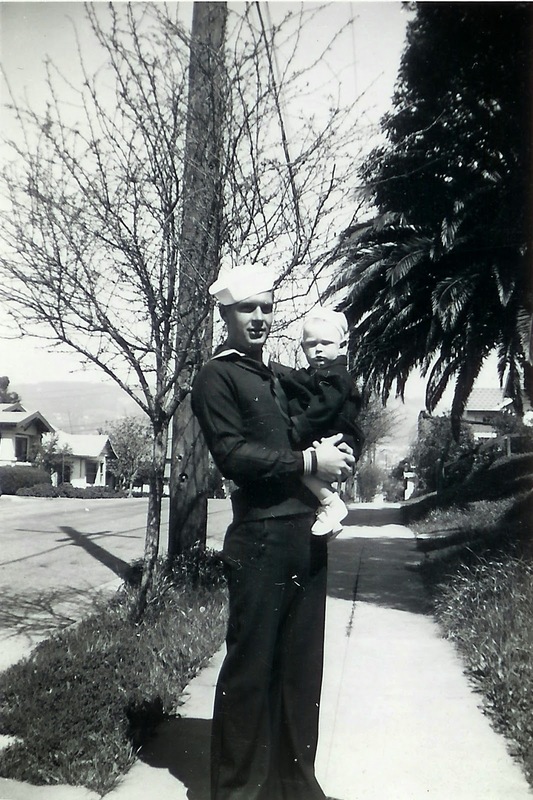 My dad served in the USN during WWII and I served aboard two USN ships: USS Los Angeles CA-135 and USS Frontier AD-25. I respect the Vietnam veterans for their sacrifice and love of country. They were my comrades. Just guys like me, they signed up to serve their country, and swore to pay the ultimate price to defend their homeland if need be. Unfortunately, I think they were used for other, more ulterior purposes. They were victims, and the people who died on both sides were victims: victims of they American political/economic system and big-money interests who were defending what they saw as their natural rights to a foreign market. I think we need to get the extraordinary, corporate money out of politics, and the sooner the better. Overturning Citizens United would be a step in that direction.